Newton City Mills at East Third and Oak Streets, Newton. Operation dates: 1875 – 1902. Proprietors of the mill were Elias Wood, Daniel Wood and D.K. Cassel. After it was sold in 1889, the new owners enlarged the facility. Since Warkentin and his business partners had experienced significant growth at the Newton Milling and Elevator Co. on West Third street, they purchased Newton City Mills in 1894 as a means of meeting demand. Even with this additional capacity, Warkentin decided to remodel the mill and add a warehouse. 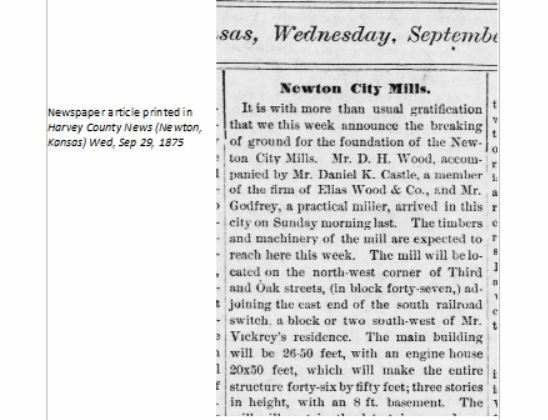 The mill and elevator on East Third became a mass of smouldering ruins when “The Fire Fiend” (per a newspaper headline) entirely consumed it in 1902.